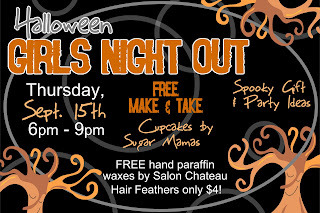 Halloween Girls Night Out - THIS THURSDAY! Just wanted to make sure YOU know that YOU ARE INVITED to come down to our store in Lehi tomorrow night (Thursday the 15th) for a night full of fun! Starts at 6 pm and goes to 9 pm - FREE make & take, FREE cupcakes by Sugar Mamas, FREE hand paraffin waxes by Salon Chateau, plus SALES throughout the store and lots of Halloween IDEAS & GIFTS!